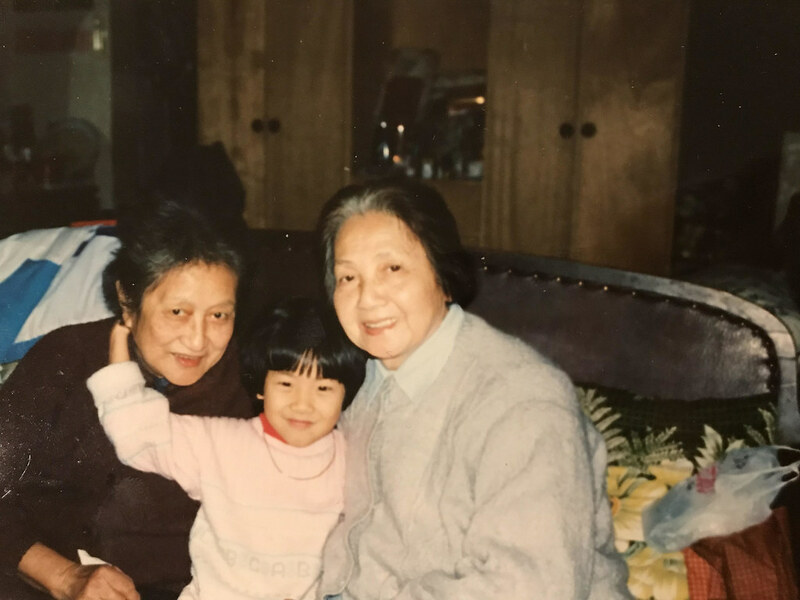 More than that, though, they’re one of the recipes that means the most to me in connecting me to my family, all the way back to my great-grandmother. 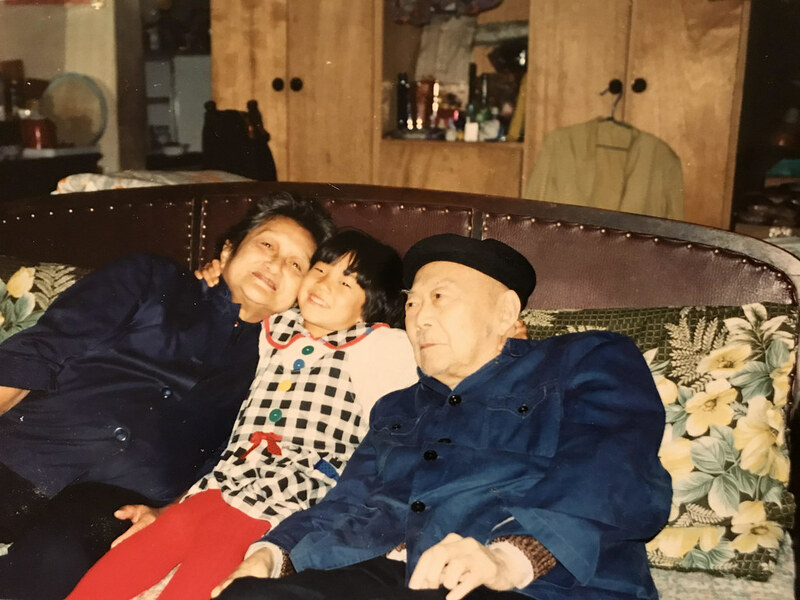 If you’ve been around for a bit, you probably remember this story already, but it was my great-grandmother’s recipe that my father adored growing up, and one that he missed so much that he learned how to make them himself when he moved here to the United States. It was kind of surreal to go back and reread the post I originally wrote about this, because this idea of food and family is what threads through so much of A Common Table, and to see the echoes of that idea in this early, clunkily-written post of mine just served to reinforce how much the book represents, at its core, what this blog is all about. The best part is that the recipe, like all good family recipes, is still changing! The version that made its way into the book, in the end, wasn’t exactly the same as the one I posted way back when–a little more this, a little less that over the years. The biggest tweak was to drizzle a little soy sauce and sesame oil over the bok choy before steaming, after an offhand suggestion from my mother when I made these for my parents one day. 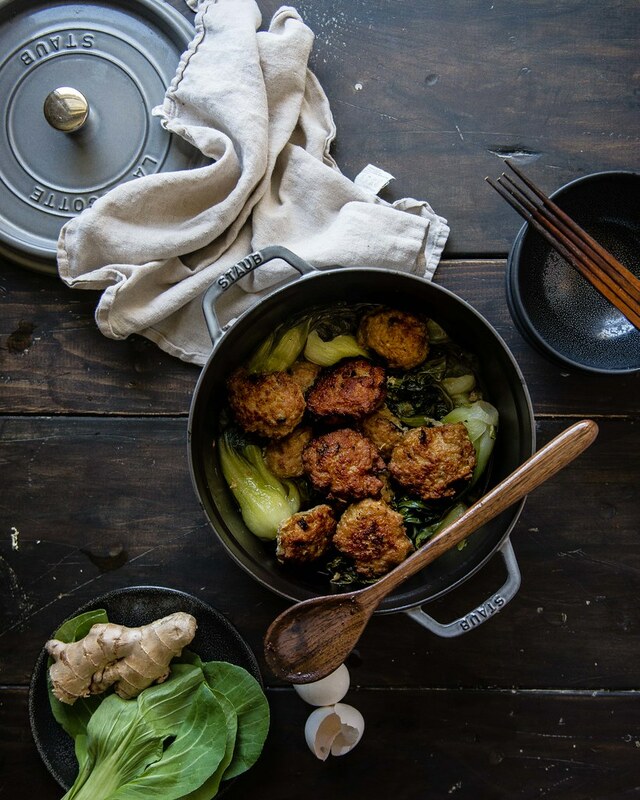 It makes the bok choy an even more delicious and savory accompaniment to the meatballs when they’re done. And, now that we have a toddler in our life, it’s taken on an easy, weekday incarnation–swap the pork for turkey, add an extra egg, and fry these in just a bare slick of oil into golden patties, and you have one of Luke’s favorite finger foods. I think my great-grandmother would love knowing that. But enough about that and more about gifts. This week’s giveaway is not just one or two items but a whole bunch of my favorite kitchen things–there are kitchen cloths from Fog Linen, in the natural color in these photos (and so many others) and the grey thin white stripe elsewhere in the book, and on top of that, beautiful walnut cooking spoons handmade by Polder’s Old World Market, the sturdiest, most satisfying cooking tools I own. I still can’t believe my luck in pairing up with these brands to give you some of my favorite things! Hop on over to Instagram to enter. As usual, the giveaway ends one week from now, on November 16 at 12:00 a.m. Until next week! 1. Prep the bok choy: Thoroughly wash and clean the bok choy, aiming to leave the heads more or less intact, save for trimming the very ends of the stems. (This method is best for small, Shanghai baby bok choy—if you are using larger and tougher bok choy, feel free to separate the leaves.) Place the bok choy in a large 4-quart heavy-bottomed pot. It should more or less fill the pot all the way to the top, which looks like a lot, but will be just right once the bok choy steams and wilts. It will amaze you how much they shrink. Drizzle the bok choy with soy sauce and sesame oil, and sprinkle with salt. Set the pot aside. For the meatballs: In a large bowl, combine the ground pork, scallions, ginger, garlic, sugar, soy sauce, cooking wine, sesame oil, and salt and stir with chopsticks or a wooden spoon until well-blended. Next, add the eggs and mix vigorously until well-combined. The mixture will seem extremely liquid—this is okay. Add the cornstarch and mix again until the mixture forms a thick, porridge-like consistency, like a thick muffin batter. Pour the oil into a large wok or nonstick skillet, or enough to coat the bottom with about a half-inch of oil. Turn the heat to medium-high and give the oil a few minutes to warm up. When the oil reaches about 375 to 400 degrees, or a chopstick bubbles energetically when inserted into the oil, use a 1/4-cup measuring cup or a large ice cream scoop to drop balls of the pork mixture into the wok in a single layer. I usually fit about 4 or 5, and end up frying in two or three batches. Let sizzle in the pan until nicely browned, about 2 to 3 minutes, then flip and brown the other side, another 3 minutes or so. It does not need to cook through, since we’ll be steaming the meatballs to finish. 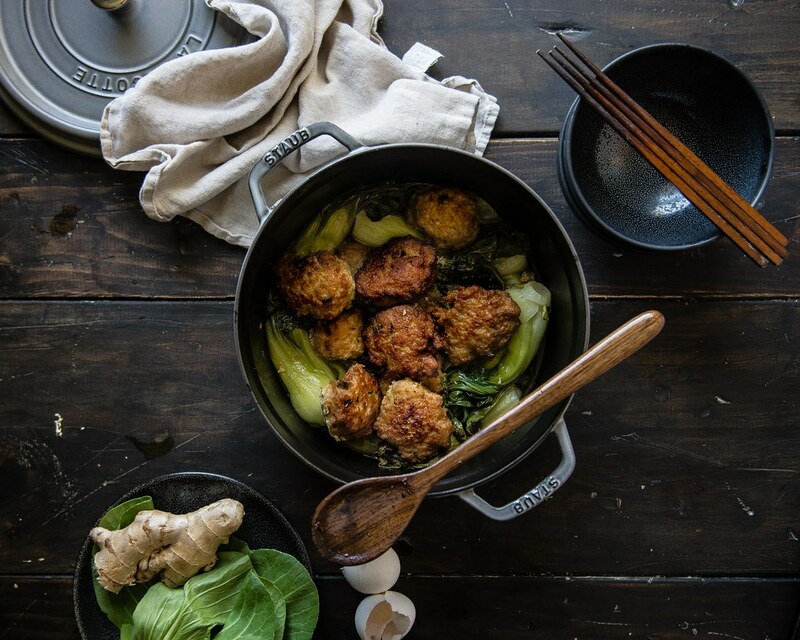 Once the meatball is browned on both sides, remove with a slotted spoon and place on top of the prepared bok choy. Repeat with the remaining pork mixture. To make these into a toddler-friendly meal (and one of Luke's favorites), sub ground turkey instead of pork and add one more egg. 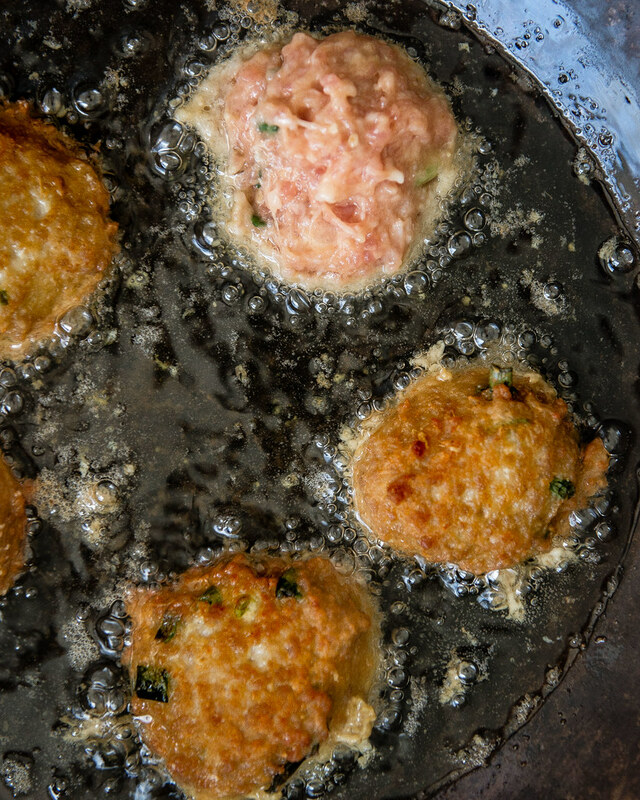 Use just a tablespoon or so of oil in a large skillet and fry into thin patties, rather than large meatballs, flipping once and cooking until brown on both sides. Serve with steamed veggies and rice. « asian pear and jasmine crumbles // a common table giveaway! Looks so good, for a cold almost-winter’s day! This recipe sounds so cosy and delicious! Putting it on my list of things to try straight away! These were delicious but my meatballs were more like patties (they flattened out). I’m not sure what I did wrong… Any suggestions? Mine came out really flat too! Still tasted delicious but not sure how to make them round like the photos.